Today’s Patent of the Day is U.S. Patent no. 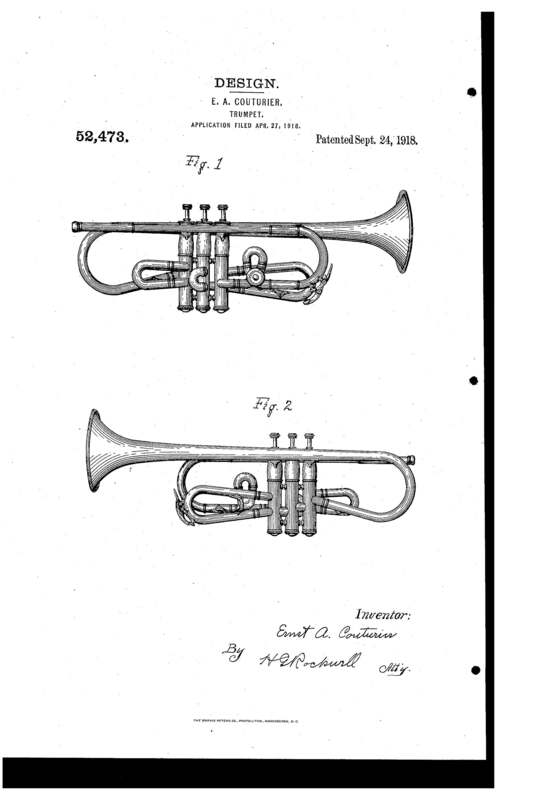 D52473, issued September 24, 1918, for a trumpet design. Not being a trumpet player, I am unable to easily discern which features of this trumpet are utilitarian, and which elements are aesthetic. Perhaps someone can comment on that. I find it noteworthy that the inventor, Mr. Couturier, is also the inventor of yesterday’s Patent of the Day, a utility patent for a coronet that issued a few years before this design patent. Even in the early 1900’s, it appears that the strength of a diverse portfolio was appreciated, at least by Mr. Couturier, wherein he sought protection for both the appearance of his instruments, as well as the functional distinction thereof. If you’d like to read either of Mr. Couturier’s instrument patents, please visit www.innovative-ip.net, and you will find them on the “Of Interest” page. Enjoy! The Patent of the Day for yesterday, Sunday, August 22, is U.S. Patent no. 5,443,036, issued August 22, 1995, and is entitled “Method of Exercising a Cat”. You may know that the issue of business method patents was considered by the U.S. Supreme Court recently (you can find the opinion at www.innovative-ip.net), and that the specific definition of what is appropriate subject matter remains generally unsettled. Many believe that too many U.S. “method” patents have been wrongly issued. When I read that someone has garnered the exclusive rights to “a method of exercising a cat by moving around a beam of light,” I have to admit that I agree, at least on general principle. That being said, and having had more than one cat as a pet, discerning a method of repeatedly controlling any element of cat behavior for even the shortest period of time is rather impressive. 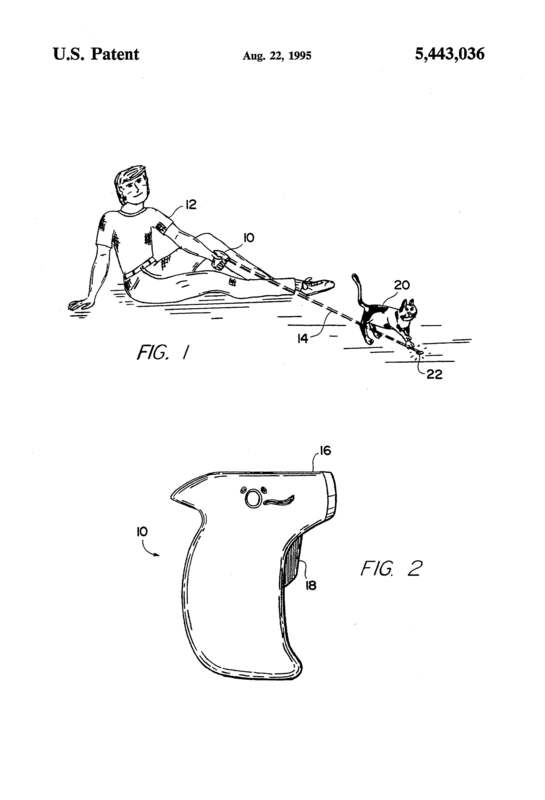 If you’d like to read the patent and learn more about a method for exercising a cat, please visit http://www.innovativeip.us/images/pat5443036.8.22.pdf. On a more traditional “utility” patent note, today’s Patent of the Day is U.S. patent no. 768,495, issued August 23, 1904, for tire snow chains. Harry D. Weed of Canastota, New York gave us this classic lifesaving invention that has stood the test of time, remaining virtually unchanged over a century. I will admit that it is this type of invention, the cleverly original and relatively timeless problem solver, that I find most fascinating. 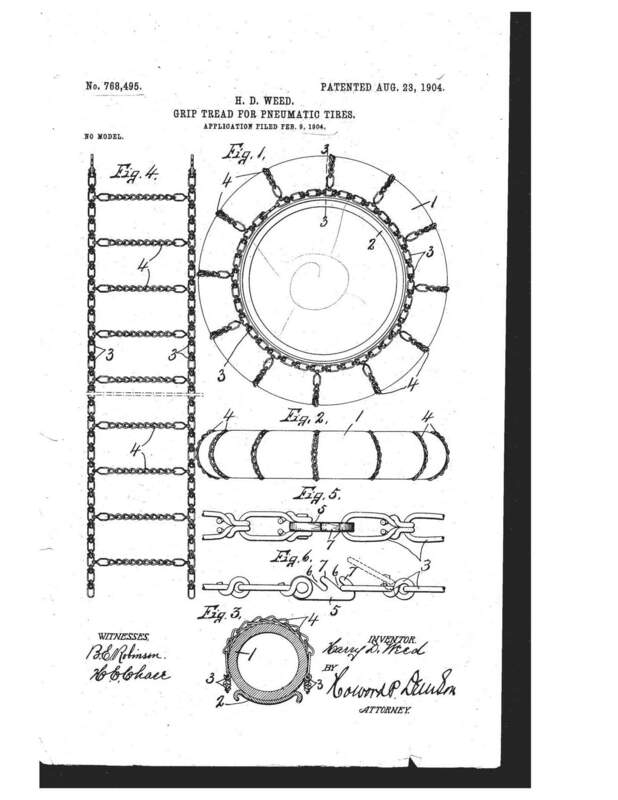 If you’d like to consider today’s patent more closely, and evaluate how close the 1904 version is to the tire chains you carry in your trunk in the winter, you can access the patent at http://www.innovativeip.us/images/pat768495.8.23.pdf. Enjoy! In case you are wondering, two common types of U.S. patents are utility and design. Utility patents protect functionality, and have a 20 year term, and design patents protect appearance, and have a 14 year term. Today’s Patent of the Day is a design patent, and so essentially has no text, only images. U.S. Patent no. 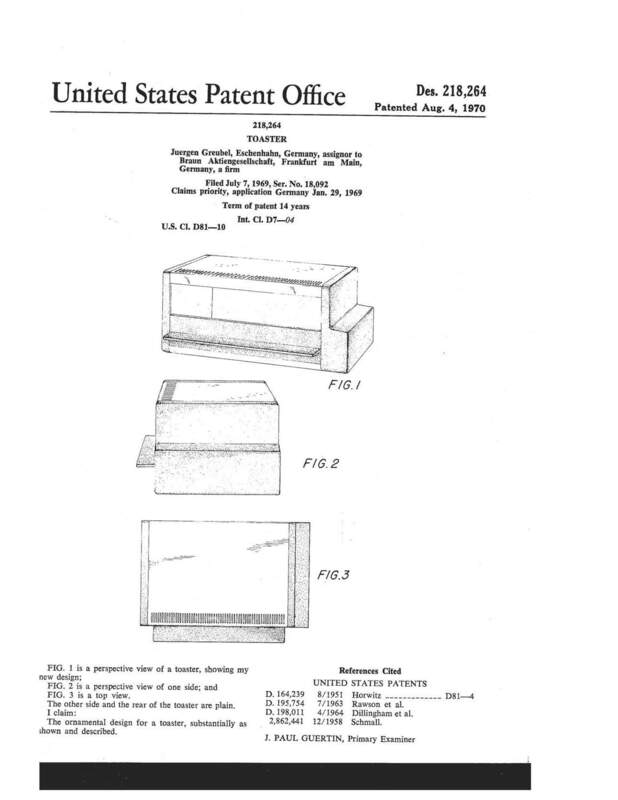 D218,264, issued August 4, 1970, for the design of a “toaster”. I find this interesting for a few reasons. First, it brings back memories of college life, where a toaster oven that looked just like this was a staple for cooking up frozen pot pies (6/$1.00! ), and even before that, memories of my friend Lois and her sweet mother who used this toaster oven to make us cheese toast on late, lazy pre-teen sleepover mornings. Good times. Second, it exemplifies that “ornamental” (in the design patent world) does not have to mean “ornate”. Simplicity can be a distinguishing feature. And, I’m a fan of simplicity. There are no additional pages to this patent, but you are invited to visit www.innovative-ip.net to see all of the Patent of the Day patents at your leisure. Enjoy!